Maybe you noticed that Autodesk puts some effort into improving Corridor design publication performance in the latest Civil 3D 2019.1 Update. The new enhancement capability to share Sample Line Groups as Data Shortcuts in projects comes to mind. We can probably also agree that Civil 3D plan annotation of corridor models still needs serious work. Then again, sometimes we simply lack the proper experiential context to wrap our head around the new and different. The Civil 3D Report Project Placeholders post connected Civil 3D Toolbox Reports to the Alignment Based Point Groups method of producing annotation for Plan and Profile Sheet publication via an innocent little link to the Reports For Point Groups video page in the Deliverables course. Templates? Who needs them sinking templates? A person called and complained the videos in that public Deliverables course detail Plan and Profile Sheet publication workflow for Survey data publication. The course did not detail how to apply the iPod (Intelligent on Demand Publication) method in practice to civil design and particularly Corridors. Huh? Serves me right for walking through the entire workflow in too much Survey-centric detail. For a Civil 3D Corridor design, the mission critical annotation locations come from what? Yes. Technically, from the Corridor’s incremental assignments of the subassembly Point Codes. As an aside - you should note that these Point Codes also produce the collected and connected Feature Lines we all usually depend on in Civil 3D design. Yep. Even the transverse Link Codes are related. We could simply employ the Points from a Corridor command found in the Corridor Ribbon to produce (aka – publish) COGO Points on the Point Codes we want to document. The Framework for Civil 3D even includes special Description Key Sets to automate the annotation conversions. Then the same Toolbox>>Reports Manager>>Points>>Station Offset to Points tools and iPOD method as detailed would work. The only problem with that is the significant hassle of the COGO points themselves. You get more than you want to mess with in many scenarios. These days Civil 3D will actually let us reach directly into the current state of the Corridor data behind and do better than that via other supplied Toolbox Reports. These reporting tools are not an automatic or magic button that solves all our Label problems without some effort. They do provide us consistent access to the data behind. To put it bluntly, we do get a basis to construct a replicable process to get to the published deliverable in the many forms we need. The Toolbox>>Miscellaneous Utilities>>Corridor>>Corridor Points Report tool is perhaps the most useful. This sadly and almost hidden newer Corridor report skips the COGO point creation mess altogether. The Corridor Points Report tool gets us to the data that matters more specifically and effectively. 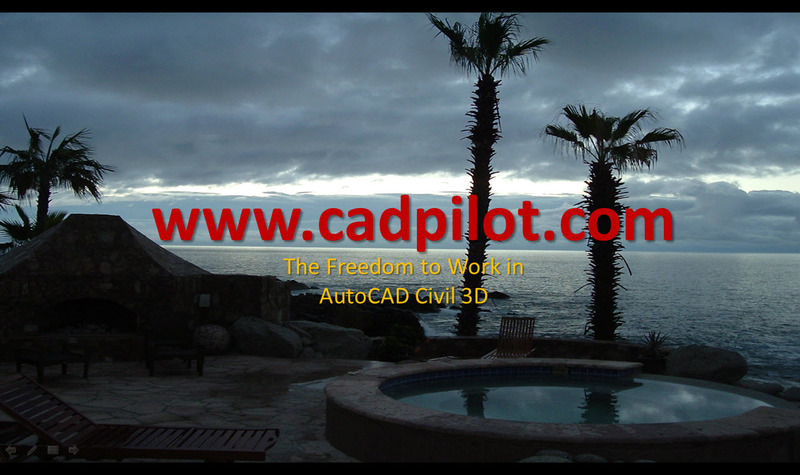 We will need to massage the data outside of Civil 3D into more flexible, adaptive, and usable forms. In principal, this is pretty much what we did with the Station Offset to Points report as outlined in the Deliverables course. Therefore you can assign any point numbers any order you require and specify. I think more than one SurveyDb is called for if you choose to employ points as the label engine..
Often we only must document only key or construction critical locations in plan. If we don’t need the Subbase or Base of a road pavement subassembly, we can ignore the data. The report may not deliver locations based on newer corridor Frequency capabilities supplied in a Civil 3D Upgrade or Release. This allows you to easily produce more potential flexibility in the sorted Label results. Subdividing the left and right corridor structure labels based on Offset Alignments comes to mind. Any published results reference and match the stationing and frequencies of the selected Baseline Alignment in the Corridor. This may mean we want an annotative Corridor (maybe in a temporary state) with publication frequencies unrelated to detailed surface model creation and other such matters. Please note that you are not obligated to employ points and point labels to produce the annotation from the Corridor Points Report tool. Say what? More on that, the specific details, and video examples in some upcoming posts. The time and effort to massage Corridor Toolbox report data in Excel may seem initially to be a waste of time. The organizational benefit is that we can produce and more consistent and more flexible annotative process to produce published corridor design deliverables in many forms. Certainly more detailed staged-grading documentation, construction stake out reports, or machine control plans come to mind. In many cases smartly applied Surface or Profile Reference Labels on to mission critical Corridor Alignments can blow through many corridor design annotation problems all by themselves. See the Civil 3D Alignment Reference Group Labels post. There is a video. The good news - When these are employed in combination with a few selected Offset Point Codes your annotative burdens may be significantly lighter. The bad news - the Group Lables reference the stationing of the specific alignment to which they are attached. The Toolbox>>Reports Manager>>Corridor>>Section Points Report tool produces incremental Station reports but only when an Assembly is actually applied there in the corridor. Do you employ this report as a QA tools to check that? In other words - find all the Point Codes also related to the Datum or Subbase at this Station increment. This report currently still sadly ignores Assembly Frequency exceptions like critical Alignment and Profile geometry points. Hmmm? There are some other innovative possibilities here. Let's explore some of those in upcoming posts.